The CSRA Business League is a non-profit, 501 © 3 organization that has supported small, women and minority owned businesses in the CSRA since 1970. 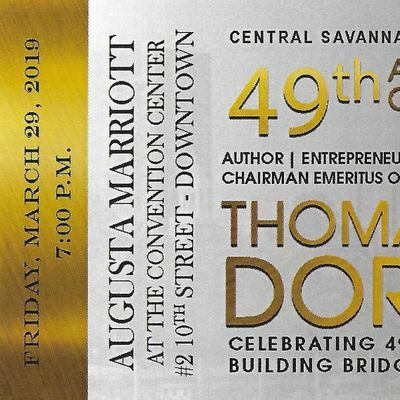 The CSRA Business League will celebrate its 49th Anniversary on Friday, 29 March 2019 in the Oglethorpe Ballroom of the Augusta Marriott Hotel & Suites, with Author, Entrepreneur, Community Activist, Mr. Thomas W. Dortch, Jr., Chairman Emeritus of 100 Black Men of America, Inc. as well as Chairman and Chief Executive Officer of TWD, Inc. The League will present the Harvey L. Johnson Small Business of the Year, the Henry H. Howard awards to honor the memory of two of its staunchest supporters, a Women Entrepreneur of the Year to a woman owned business in the CSRA and recognize a local not for profit organization. The CSRA Business League has been a bridge to success for small, women, disadvantaged and minority owned businesses in the CSRA for the past 48 years. Tickets for the event are $50.00 and can be purchased at the League’s office located at 821 12th Street or from any member of the Board of Directors. If you have additional questions or you need additional information, please feel free to contact the League at 706 722 – 0994 or by email at ZWxsaXNhbGJyaWdodCB8IGJ1c2luZXNzLWxlYWd1ZSAhIG9yZw==. Mrs. Veronica Shareef is the Board Chair and the point of contact is Ellis Albright.